Even though we are approaching the winter months *shivers with fear* it is still important to keep SPF in mind! For oily skinned girls like myself, this stuff is amazing! 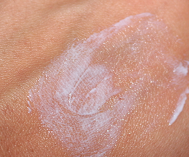 The consistency is similar to a thick sunscreen, because it essentially is sunscreen, just with more benefits. I prefer to mix it in with my regular moisturizer, so I get the SPF benefits, use less product and then it is also not so thick on my skin. It can be tricky to apply due to it's consistency but you can warm it up in your fingers if you just want to apply it alone . As for mattifying I definitely notice a difference in my skin's oil production when I don't use it. I wouldn't say it keeps me completely matte all day (nothing does, I am super oily) but it is a great addition to my mattifying skin arsenal! First of all, this is a Canadian brand, which I love!! I have battled with acne for literally as long as I can remember, grade 5 to be exact. I'm now 25 so that is a solid 14 years. It was very embarrassing being so young with such large and noticeable acne mainly on my forehead. As I got older, into my teens, it stayed on my forehead and moved to my nose and chin. Now, my acne (I am guessing more hormonal) is pretty much only on my cheeks! It comes and goes and isn't as constant which is great.. but I just want it gone 100%!! I have extremely oily, acne-prone skin. 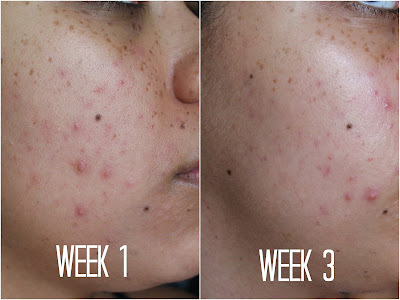 But I think in addition to helping with acne it helps keep my oiliness under control! I was sent this by Reversa to try out, and after trying just about everything, I was skeptical. But I am really really impressed! I use it twice a day, in the morning and at night. I don't find it drying, I do however have very oily skin! 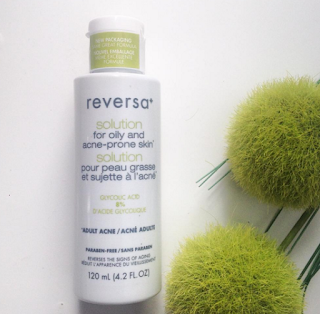 It is 8% glycolic acid, so if you have sensitive skin start daily then move to twice a day. It is also SO important to use SPF, acid makes your skin more susceptive to burn and skin damage. During "that time of the month" I did have a breakout or two, but nothing major or sore, and it did not stick around for long! If you have never used acid on your skin, don't worry, it's not scary! It's a chemical way to exfoliate your skin, and this way you avoid uneven or sharp exfoliators that can cause mini tears in your skin. It does not burn, but there can be a small tingling sensation. It dries quickly on the skin, then you can apply your SPF, moisturizer, whatever is next in your routine! Keep in mind, if you commit to any skincare routine, as I committed to using this everyday, you should see improvements in your skin! Consistency is key, no matter the skin issue. What are your favourite oily, acne-prone skin products?! Sephora VIB Sale Dates November 2015: 20% off! *Save extra by shopping on EBATES. Earn a % back! YAY! 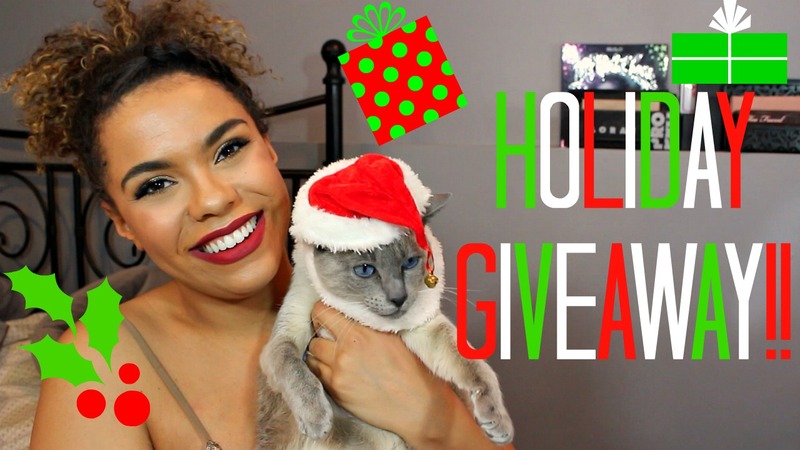 It is that special time of the year where you can save on high end makeup! 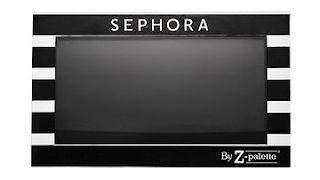 The Sephora VIB Sale November 2015! It's a great time to buy gifts, stock up on your favourites, or purchase something you have been eyeing! 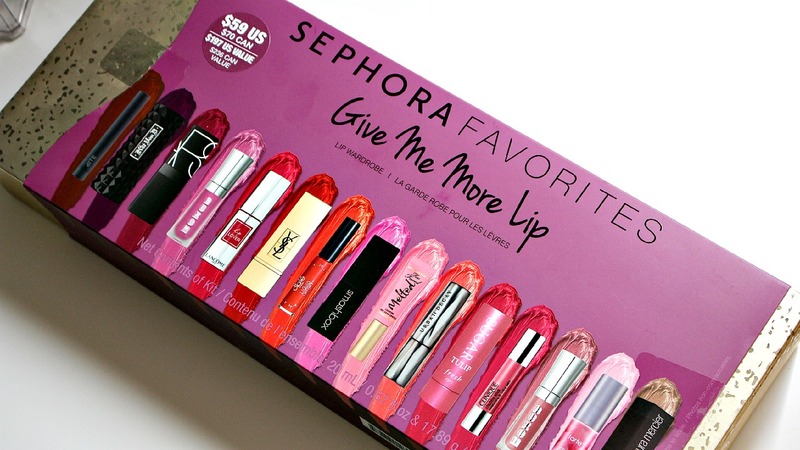 Here are some of my favourites from Sephora to consider on your shopping trip! - Can be drying but they wear forever! - So much product, especially for the price! - SO MUCH FUN TO PEEL OFF! 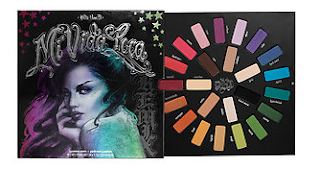 - Amazing for makeup lovers or people looking to experiment with color! 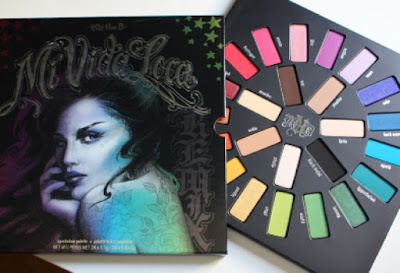 Before you say it/think it this palette is totally wearable!!! Even if you are not a bold color fanatic, I promise! My YouTube review can be found HERE. The color wheel style layout was the first thing that drew me into this palette, and the thought of all the possibilities. When I saw the price tag, at first I thought "hell no" but when you think about it, there are 24 shadows in here, that is double the size of your average palette! I have seen some complaints about the packaging being to big, but I love it!! Not every palette needs to be compact and travel friendly. This is a makeup lovers' palette, or a great way to start experimenting with color! Pigmentation is great, some shades (the metallics) are better when used wet, the majority do kick up some powder but I don't mind, that means extra color pay off! It can be hard to find a good purple! Purple is flattering on any eye shade, all over the lid, crease color and lower lash line. I mean, you cannot deny the beauty of that second shade in! The blues and greens make great lower lash line colors if you don't want to get too daring. As well, yellow on the lid with winged liner?! It can't get better than that, I mean if Beyonce can do it, so can we! These are my favourites! 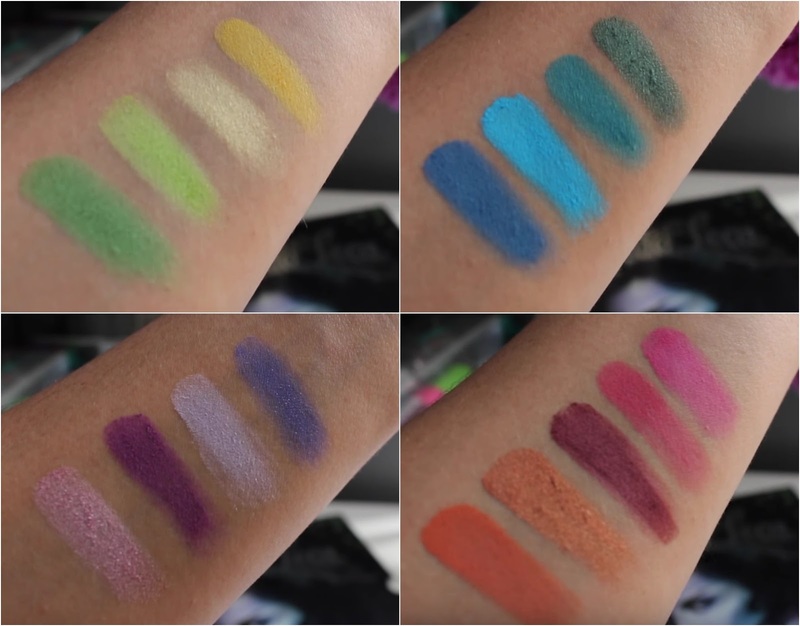 Anything in the pinky/orange family can add that little extra *something* and bit of interest as a crease color! 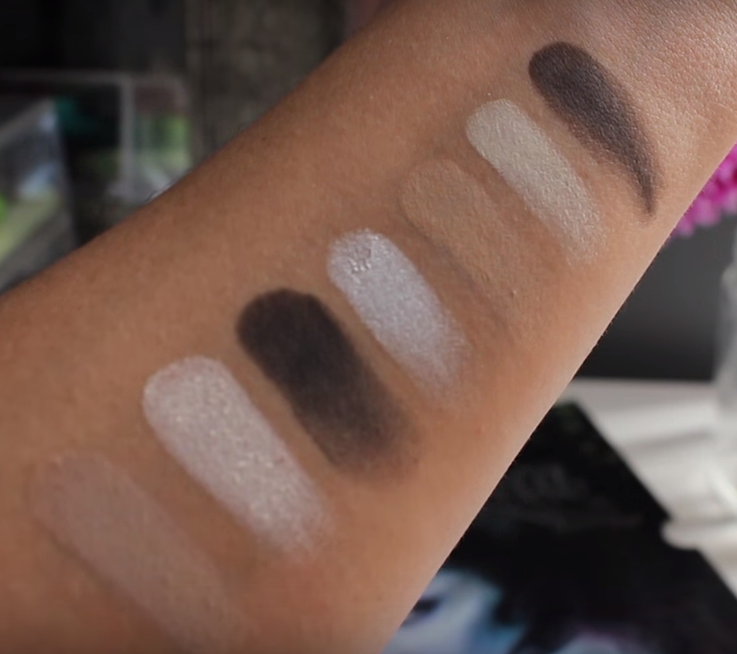 The middle selection of neutrals is one of the things that makes this palette truly unique. 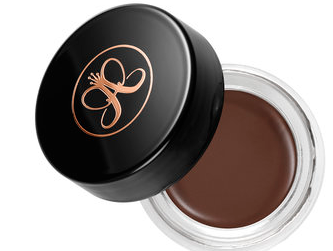 These shades make great bases, transition shades, crease colors and highlight/definition. My only issue is there is no "mid" brown, it is either light or super dark, to solve this problem I mix together but I would rather not! Proof!! TOTALLY WEARABLE! These 3 looks are using only the palette! Let me just start by saying, I LOVE THIS KIT. 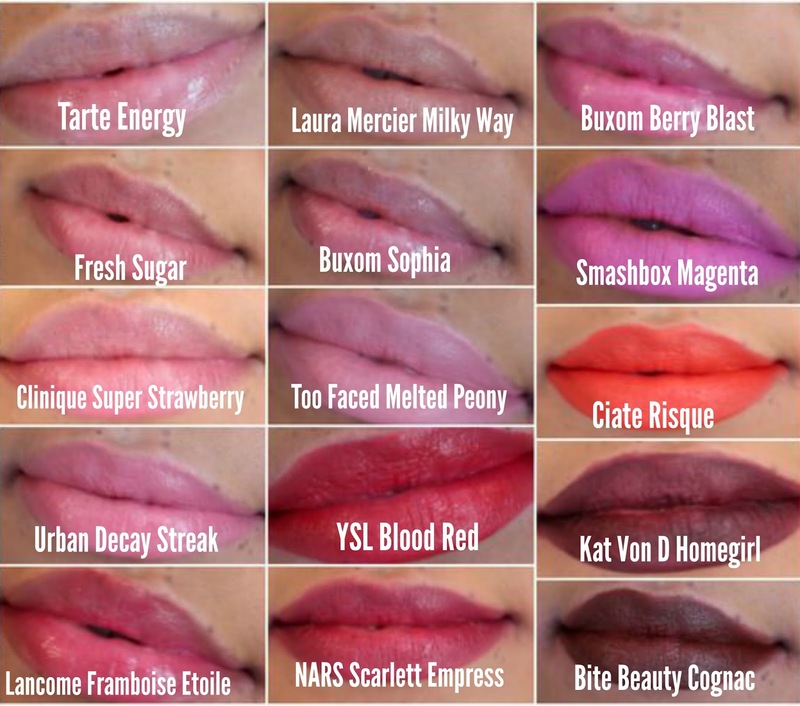 It is described as a "lip wardrobe" and it is exactly that. 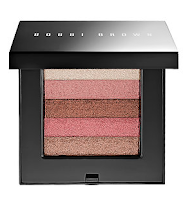 It is filled with a beautiful selection of finishes, shades and formulas. It is the perfect way to discover new brands, and colors you wouldn't normally pay full price for! For example, my ever coveted MUFE Lip Liner in 3C would not have been brought to my attention if it wasn't for the Give Me More Lip in 2014! I have a YouTube video with product sizes and more lip swatches that can be found HERE. They are also not your typical shades, there are some classics but then some more interesting shades like Laura Mercier "Milky Way" lipstick and Bite Beauty's "Cognac", both pictured below in my lip swatches of the kit. Although $59/$70 seems like a pricey purchase, it has 4 full sized lip products, Smashbox Be Legendary Lipstick in "Matte Magenta", Ciate's new liquid lipstick in "Risque", NARS "Scarlett Empress" (not their Audacious formula but still pretty) and Urban Decay's sheer lipstick in "Streak" would easily run you the cost of the kit. That being said, they are not small sample sizes, many of the products are half the size of the regular and I mean, who actually finishes lip products?! I think it's a myth. 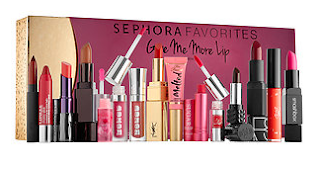 The packaging is also the best I have seen from one of these kits, the gold box is totally gift worthy, if you take off the outer sleeve it looks like a luxe box of chocolates (the next best thing to a box of lippies!). Another great option, if you are on a budget and have beauty lovers in your life is to split up the kit, in any number of ways. That way you are not only giving an excellent gift, but you are saving some money! Will you be on the hunt for this kit? !